It has unfortunately been kinda cold again recently and today wasn't an exception. I decided to start with a black base with my black tights and black long-sleeved top from Topshop. I do usually wear a black vest under this top too because it's a little sheer in some lights. 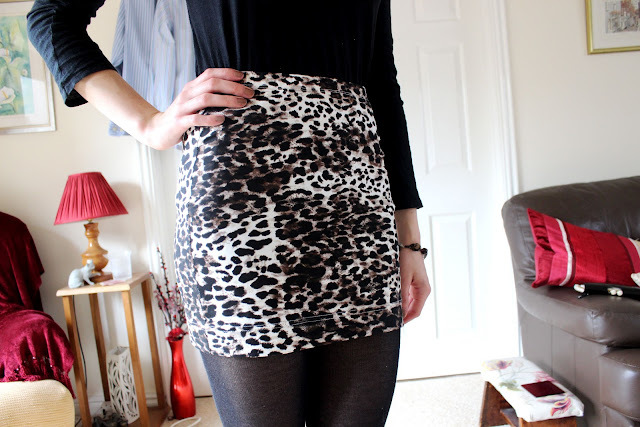 For the centre-piece I'm wearing this stretchy mini-skirt from H&M in a sort of leopard print. This skirt was only £3.99 and it is so comfortable! 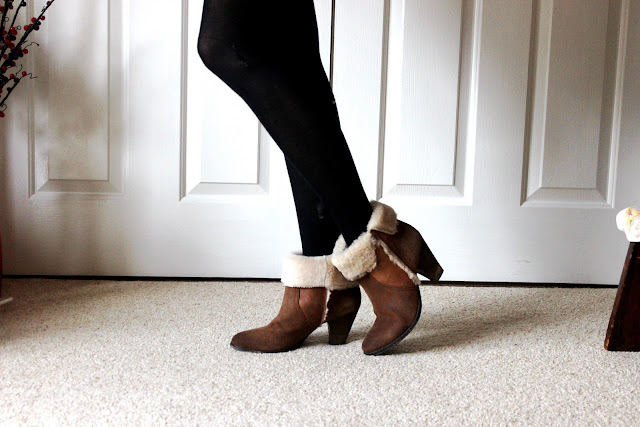 To tie into the brown colours in the skirt I decided to wear my tan boots from Dune. These are so comfy and have a small but chunky heel so they are so easy to walk in. Again tying in with the browns my bracelet is made of these wooden beads, and also blue ones, in different sizes with a layered effect to look like multiple bracelets. I can't remember where it's from I've had it for many years and don't wear it often enough! I quickly grabbed my Ted Baker clutch which is leather but it's patent black leather and has amazing lining too. It's mostly just my wallet but it's a decent enough size to use as a clutch bag too. My nails are brown and the colour is from LCN and doesn't have a name just the number 208. It's a gorgeous colour with a pearlescent shimmer in it but it's not in your face. My lipstick is a bright pink from MUA. It's shade number 3 and I just felt the look needed something exciting again so I decided this would be fun! Please hype me on LookBook.nu! Click here to see the look!